A custom made, original Suzanne Neville wedding dress. Ivory in color from her 'Portrait 2017' collection, known as 'Salvador'. A fitted Italian matte crepe gown with beaded French lace top and full length sleeves. The dress consists of a silk underlay, with small button details to assist in adjusting the length throughout your evening. The train can also be bustled up in the back, allowing you to move more freely for your reception if you wish. The sleeves fit perfectly just passed the wrist. Originally purchased from 'The Wedding Club' and hand made to fit the dress was perfect for our wedding abroad. The illusion neckline is made from light, breathable material making it cool to wear and the sequin detail brought added glamour, sparkling at every turn. The button detail was perfect when changing from heels to more of a flat shoe later in the evening. Given the sheer detail of the bodice, bra cups were fitted in the front (size 32c). These can be removed easily if required. Originally a wedding dress size 12, I had it altered to fit my size. I am a size 10 in the bottom and an 8 on top, full measurements below. I teamed the dress with a plain, Italian lace veil and a hair piece that matched the crystal detail on the bodice perfectly. Both are included in the price I am asking along with the original dress bag. The dress is in pristine condition and has been fully dry cleaned. 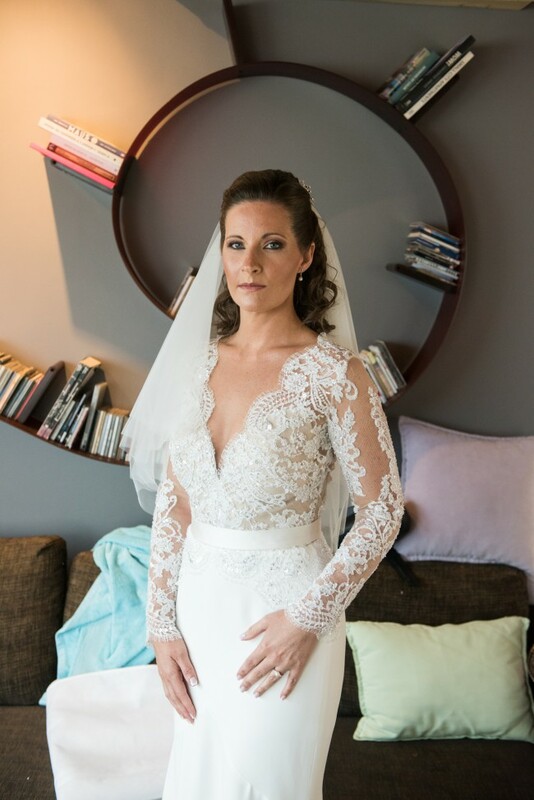 The dress was handmade and delivered to me in June 2018 and I was wed in July 2018. Our wedding was such a magical occasion, I would love nothing more for another bride to feel as special as I did wearing this gown.